A local youngster has been getting a taste of what it's like to work on a live construction site thanks to a partnership between a charity and a national house builder. Tom Sweet,18, from Milton Keynes has been taking part in Get into Construction, an initiative run by youth charity The Prince's Trust in partnership with construction firms. As part of the programme, Tom has been spending time working alongside the construction team at Whitehouse Park, a new homes development being delivered by leading national house builder Bovis Homes. As part of his two-week placement at Whitehouse Park, Tom has been working alongside the site team, led by site manager Dean Coton, and has been involved in a number of building tasks, including carpentry, plumbing and ground works. William Adams, Build Director for Bovis Homes' East Midlands Region, said: "Bovis Homes was delighted to be asked to take part in the Get into Construction programme. We want to nurture the next generation of talented house builders and offer opportunities to those who might otherwise struggle to get into the industry. "I know the whole site team at Whitehouse Park thoroughly enjoyed having Tom join them and we hope he gained a lot from the experience too." Tom said: "I really enjoyed my time on site at Whitehouse Park and feel like I have learnt a considerable amount of what it takes to work on a successful construction site. The two weeks also gave me the opportunity to reflect on what I'd like to do in my future and I am now committed to a career as a plumber. I'd like to thank Bovis Homes and The Prince's Trust for giving me the opportunity and the perfect start to what I hope is a long career in construction." John O'Reilly, Director, The Prince's Trust in Central England "At The Prince's Trust, we know that most young people have the determination and willingness to find jobs, but often lack the opportunities to do so. 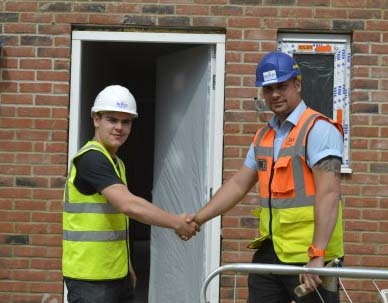 Partnerships between The Trust and leading employers such as Bovis Homes are invaluable to offer jobless young people workplace experience and give them the confidence and skills they need to move into employment." Get into Construction is a five-week pre-employability skills programme designed to help young people gain the confidence, sector-specific skills, qualifications, and work experience that will help them in finding employment, apprenticeships, training, or education opportunities. Whitehouse Park is a landmark new development with a broad mix of brand new homes that combines the convenience of city living with easy access to the Buckinghamshire countryside. Approximately four miles outside Milton Keynes, it is 35 minutes to London by train.